Deliciously refreshing Earl Grey tea. 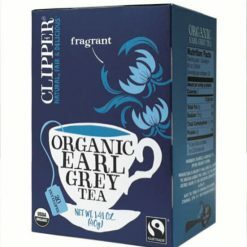 Clipper Organic Earl Grey Tea comes from very special tea gardens set high in the beautiful mountains of southern India. Here the China tea plant thrives in a wild and remote environment. This organically grown China tea, delicately scented with natural bergamot flavour, makes the perfect cup of Earl Grey. The company works solely with producers who are striving to improve standards of welfare for workers and their families. 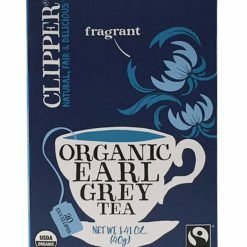 Through fair trade, Clipper Tea supports tea producers and surrounding communities, by paying a fair price for their tea, as well as a fair trade premium which can be invested into the business or community. This premium is often spent on impro”astructure and supporting community projects, such as roads, schools and medical resources.